Well here I am again, out of retirement (again) but the opportunity to watch and review a film sent to me by the production company is always a no-brainer. Let me begin by saying this film is not classically HORROR but it's subject matter and the means of delivery firmly set it in the psychological thriller category so it's all good. Her descent into madness is beautifully captured as we follow Kate on a journey that takes her from random bars drinking with strangers to being a self-imposed prisoner in her own home. When I say follow, I really do mean follow! I counted very few seconds of screen time without Kate being prominent. This aspect is far from being a bad thing, Whitney Able's portrayal of Kate is a shining beacon worthy of so much praise for it's infinite beauty! Whitney Able is supported on her ride by Alexandra Breckenridge who plays her absent girlfriend Leah along with Brendan Sexton, her neighbour and Michael Eklund as Benny, a welcome distraction for Kate on this night of madness! In addition and one of those bizarre coincidences in life, Redman has a very small cameo as a doorman and familiar face for Kate. So, what about the coincidence you ask? I received the DVD copy of this film just 2 days after seeing Redman in concert with Method Man, Not much I know but when you live in the UK and see a duo like that in concert the same week you're sent a film which features one of the act, it's fairly weird. On a side note, Redman was fantastic as was Method Man, The former even selling his material from the stage and good enough to sit around after the gig signing everyone's gear! Good guy! Anyway, back to the film. Dark is a consistent slow burner but it creates the kind of tension that will keep you gripped throughout. The slow pace continues BUT to great effect as you, as the viewer are taken through all emotions possible in this artistically voyeuristic tale! Elias who provided the screenplay here previously gave us the film GUT which had the same artistic stamp. 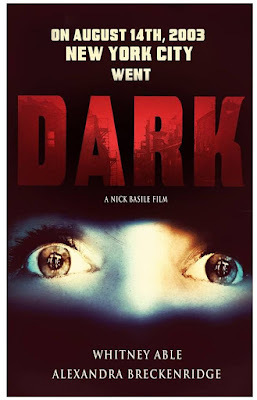 Directed by Nick Basile (who also has connections to GUT) delivers a great film here and hopefully it and him will get the recognition they rightly deserve. Another quick word on the star, Whitney Able. I can't praise her performance enough and after seeing her previously in MONSTERS, another low budget, cultish slow burner! I can only hope we all get to see a lot more of her in the future. Dark serves as a piece of artwork which needs to be appreciated! 90 minutes of edge of your seat tension which really gets under your skin and keeps you guessing all the way through. It succeeds greatly and it's fantastic conclusion will make you think long after the credits have rolled! I would highly recommend this film and while I believe it's going to be doing the festival rounds, I do hope for a wider release soon.